Its the best out of 2? As long as no one takes out your turret. Seems to happen evrery other battle. The speed makes her enjoyable enough but the guns are only okay. Fairly high pen for 15" I guess. Also has the same armour issues as the rest of the French BB line (IFHE makes Baguettes cry). This video is a lie, you used aimassist. Any ways your camo aint lined with gold!! 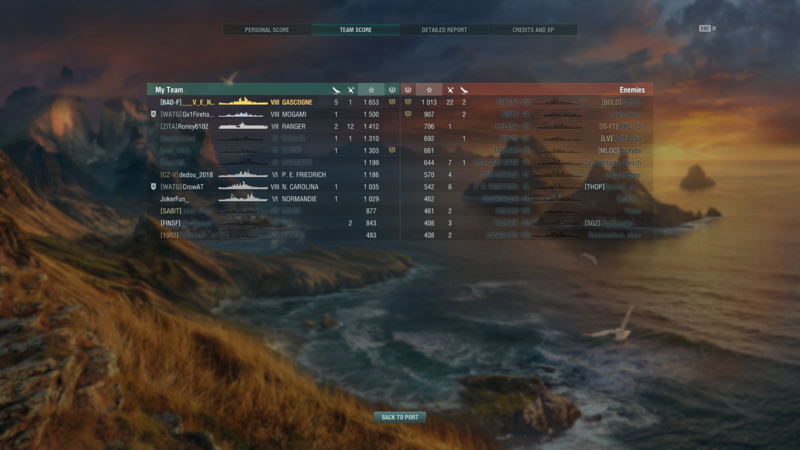 While I don’t see any reasons given why Gascogne is supposed to be “best” at T8 I can agree. It might be personal preference but the combination of speed, amazing pen and reasonable hit chances do very well for me. In my opinion she uptiers very good and can even fight successfully against T10s, something I wouldn’t say about my other T8 BBs. I can't agree with that. It can be overmached by almost every BB... and its dmg pinata for every HE spaming cruiser... It's a good ship, but the best T8 BB... not by a long-shot. 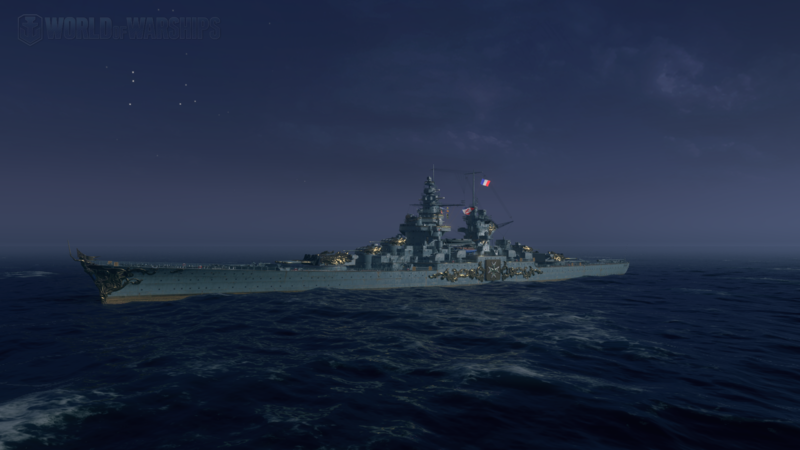 It can be overmatched by two BBs like every other tier 8-10 battleship? True. It seems almost as accurate as Alabama and those great secondaries. You can overmatch NC only at the bow and stern, as the mid section is 38 mm. Bismarck and Tirpitz have even less 32 mm area and basically are mostly around 50 mm. There's a sharp contrast between overmatch in a few sections and overmatch everywhere. It's what for example allows Bayern to be still somewhat tanky vs T8, while Dunkerque just falls apart when hit. And the difference this makes in HE resistance is even more pronounced. I'd argue most T8 BBs do, by virtue of being T8 BBs clad in 32 mm armour at the very least, with reasonable speeds and main armament. Pleade do create a new thread for every avarage game you play. Also, you are wrong, Bismarck is better. NorCal? The Massa shines when she is in secondary range, but otherwise? While I didn't disagree at all, I would just see both on the somewhat same level. While you have a point about the plating I for myself see huge differences. Kii and Tirpitz don’t do well for me when uptiered but great in the T7-9 bracket. Gascogne does well at all tiers due her mentioned strengths. Bama is somewhere in the middle for me. But again this is also preference. I don't own a Gascogne, but I don't feel like the Kii is doing too shabby. Tirpitz I would guess does slightly worse than Bismarck, as the higher tiers offer less chance to torp stuff, but Bismarck does fine, given the ship is all-round solid with good armour and hydro. Kii is not too terrible either. Basically an Amagi that is a bit less fool proof but has a more versatile kit. When did 100k dmg in t8 BB become a staple of bestest ship? Pretty much so yes. However Kii “feels” more vulnerable than Amagi and you even “feel” the sigma difference pretty harsh even if it’s is not a big number. Her overall accuracy is still IJN decent but overall Amagi is the better ships at distance where most engagements at higher tiers happen. I don’t even know what I find so amazing about Gascogne. I guess the speed is one factor. You can flank, engage, disengage at will. 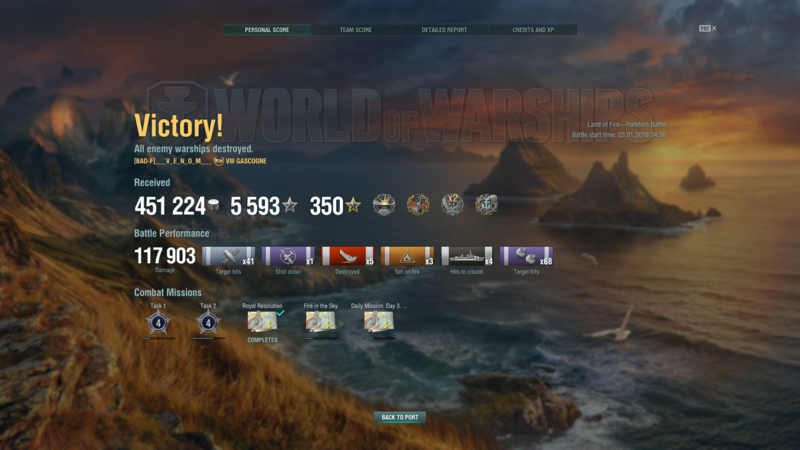 - true Battlecruiser feeling at its very best!!! 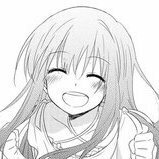 But she also has amazing Pen and decent accuracy so while you are not nuking ships left, right and center you don’t feel relegated to a pure supporter either. She’s just all that PEF should have been. Haven’t played since the buff but now the north cal has the same rudder shift as the Alabama but better accuracy and heal it must be very strong. I managed 125k in my normandie. Does that count? Either way i wouldn’t mind getting the ship, but dat price tab doe. The issue here is that it "feels" that way, thus it's a difference in feelings, which are subjective. For example, I find Kii a somewhat comfortable ship to play, as far as T8 BB go in general. Angled the armour holds up, 10 guns even with 1.7 sigma are powerful and the AA is among the best at T8 (just a case of whether you prefer NC's massive short range advantage or Kii's slight long and mid range advantages). Together with the credit earnings from Kobayashi camo, I take Kii over Bismarck these days just for the versatility of having some strengths in most areas, just not being specialised in any. Except maybe AA. more like one of the worst t8 premiums in the game along with the roma! why? horrible dispersion, every 203 mm or 152.155 IPHE cruiser loves to shot you, no super heal to compensate that, 8 guns, 4 in the back and 4 in the rear oh and those are 38cm ones so you will not overmatch a lot of ships unlike repuplique 43cm guns that can overmatch 30mm of armor. Congratulations for having a good game and dealing 100k damage in it when you are top tier however other t8 bbs or other ships can do this aswell harder or easier, but the real struggle will be when you will be t9 and t10 where is full of mushashis and yamatos and zao oh and dakadaka harugumo and worcester have fun then being able to do something that helps your team winning. And best t8 battleships are amagi and north carolina. why? because they have guns that punish everyone unlike roma, gascone, bismarck, tirpitz. Massa can work aswell but at higher tiers cruisers wont enter in your secondary range unless you manage to sneak on them.